Traditional music of India that has never been heard or seen before. The balladeer sings a song of the spluttering waterfalls of the river, of the rain, of the sand the song of the whispering forests. Sings the balladeer sings of the golden fields of wheat the squeak of the rope at the well the splash of the washer man’s cloth the swish of the grass cutter’s blade the bang of the blacksmith’s hammer. Sings the balladeer sings, sings at a pitch so high that it bursts the drums of all ears and only those can hear it who know the taste of jaggery of coriander, chilli and salt who know the song of the wheel as it grinds and grinds sings the balladeer sings he sings the colours of earth. 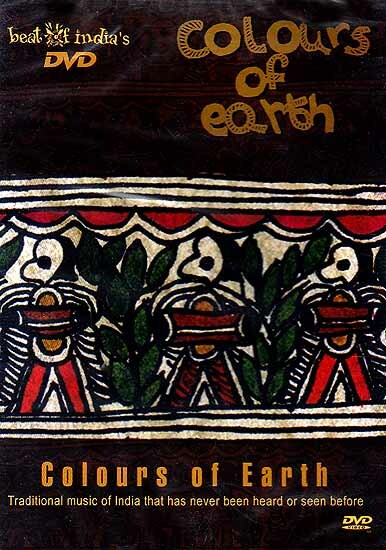 Colours of Earth is a musical voyage to the pulsating rhythms and vibrant melodies or traditional Indian music. From the colourful deserts of Rajasthan to the Barren towering mountains of Lahaul & Spiti in the Himalayas. From the banks of the Ganges to the Bengal of Tagore form the echoes of 90 year old Jhusia Damai’s forgotten ballads to the popular Bhojpuri tunes of Manoj Tiwari that are on every child’s lips Colours of Earth is a 1hr musical film bonus tracks of 6 songs and information about artistes and instruments. Beat of India began in the year 2000 with the aim of popularizing the traditional music of India and since then has been traveling to remote parts of the country recording with some of the best artistes the most rare and unique traditional music of India. Apart from DVD, CD & Cassette titles the beat of India website has a large and constantly growing collection of music form many regions. A substantial part of the revenue generated from all sales is sent back to artistes as royalty.